Contract Magazine's June 2017 issue dedicates a full spread to the modernist masters I.M. Pei and Florence Knoll who recently celebrated their 100th birthdays. Pei marked his 100 years on April 26 while Knoll celebrated on May 24. The two Modern pioneers are renown for allowing simplicity in form and function to flourish. While Pei constructed uncomplicated, open, and light-filled spaces, Knoll designed furniture that enabled user interaction within such spaces. 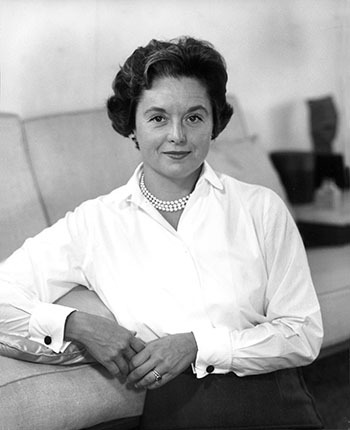 Knoll modestly referred to her products as the “meat and potatoes” created to answer design problems posed by modern interiors. Knoll’s designs embody the straight lines and rationality of modern architecture as to blend in with a space, not to be its defining feature. An elegantly situated Florence Knoll Relaxed Sofa. To celebrate a century of Florence Knoll and her inspired brand of modernism, the company has expanded the Florence Knoll Collection with the addition of new and archival products. Echoing the rational and architectural profile of the Florence Knoll Sofa and Settee, the newly introduced Florence Knoll Relaxed Lounge Seating presents a softer and deeper update of a timeless classic. The Collection also includes the Hairpin™ Stacking Table, an archival design introduced in 1945 and Florence Knoll End and Side Tables, a series of Florence Knoll Dining Tables, as well as the Mini Desk.